Cursory Review 2018: Development stopped ~2012, last version left free to download. Developer shifted focus on other rpg-related tools, among others, Skwyre VTT. Looking to re-create that gaming table feel when playing traditional paper and dice RPGs online? Try ScreenMonkey Lite 1.8! ScreenMonkey is a program GM's can use to moderate their online campaigns. 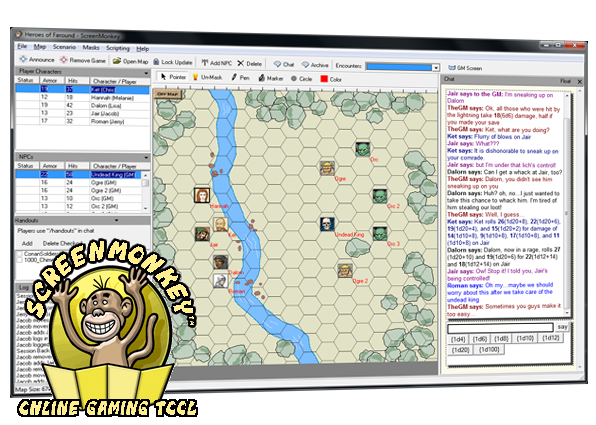 ScreenMonkey can be used to play any traditional paper and dice RPG. Only the GM needs the program - players only need their web browser! ScreenMonkey is a server program that GM's run on their computer. Specifically, ScreenMonkey is a highly specialized Web Server designed for online gamemoderation. The program features a map display area, several grids for information about characters and NPCs, an event log, and a chat panel. The players in the game (other than the GM) connect directly to the GM's computer with a web browser. A built in announcement system lets GM's announce games in various ways, and provide URL links to the GM's computer. This means the GM and players do not need to mess around manually entering TCP/IP addresses and ports. GM's have access to the full functionality provided by the ScreenMonkey program. GM's can move and edit all miniatures on the map, set the background picture, set and recall encounters, and see all chat items sent by all players. Players use a web browser interface. Players can add and remove characters, set character information, move their characters around the map, set and remove facing/looking arrows, and chat. Great potential, but feels "unfinished"
Downloaded demo to check it out. You have to specify a campaign right off the bat, but you can change it later. Sadly, had trouble with maps right off the bat. Accidentally opened an image called "offmap", and it stayed stuck in the upper left part of the map area no matter what I did to clear it. Tried opening new maps on top of it, but nothing works. I even tried to delete the files that saved the last session and the offmap file itself; all that accomplished was creating a blank white box just as big as the offmap image was. Trying to create or alter PCs or NPCs is hidden from me. Tried various functions, but the menus are very slim, so there's not a lot to do there. Tried to open the Help file, but that failed; you have to open it manually from Explorer. Even then, there were more topics on scripting than on using the basic interface. I think this thing has potential, but again, unless you are are programmer/coder, it's of no use to you. It also seems rather… old, produced many years ago. Very little community activity; months go by between forum posts.